A super deal for this festive season. An excellent gift of senior citizens! Height adjustable, high-grade aluminium walking stick with quadripod base and palm shaped handle. The base swivels ensuring that the base is firmly placed on the ground irrespective of the angle of pressure or angle of the surface. Built-in shock-absorber provides cushioning effect at every step. The palm shaped handle provides superior grip and comfort. For regular use, for people with minor balance issues and weak legs. A super deal for this festive season. An excellent gift of senior citizens!1. 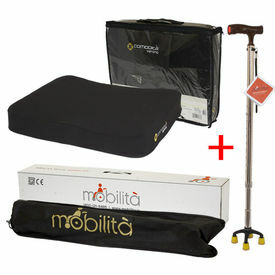 Mobilita walking caneHeight adjustable, high-grade aluminium walking stick with quadripod base and palm shaped handle. The base swivels ensuring that the base is firmly placed on the ground irrespective of the angle of pressure or angle of the surface. Built-in shock-absorber provides cushioning effect at every step. The palm shaped handle provides superior grip and comfort. For regular use, for people with minor balance issues and weak legs.2. Verona Cushion This cushion provides comfort for those sitting for long periods on their office chairs, wheelchairs, car seats or even during their flight. Contoured specifically for maximum comfort Coccyx or tailbone relief through special contour High resilience foam provides comfort and support Water-proof removable cushion cover Non-skid bottom fabric Cloth and plastic cover for easy transportation. Dimensions: Width: 18", Depth: 14.5", Height: 2.75" Can be used with regular chairs, wheelchairs, car seats and airline seats.